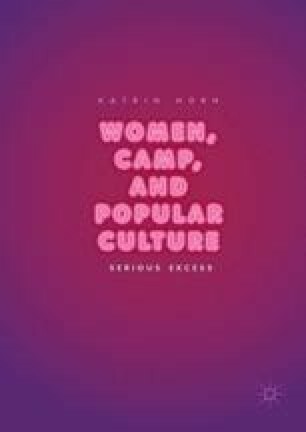 The conclusion summarizes the book’s central arguments by returning to Sontag’s seminal “Notes on Camp,” which states that camp “involves a new, more complex relation to ‘the serious’.” In contrast to Sontag, who emphatically uses quotation marks, Women, Camp, and Popular Culture insists on taking the serious literally, appropriating it as a technique for Sedgwick’s reparative queer critiques. As detached attachment, camp empowers a participatory critique, which is capable of disrupting the cultural consensus and creates new webs of affinity. The conclusion thus crystallizes Horn’s central claim that camp results from a “more complex” relation to popular culture; it generates critical awareness for its incongruities and questionable normativity, yet gives room to celebrate its affective powers of pleasurable enjoyment.